He had it all. He was twenty-eight and he ruled the hearts of many women and men. It was the era that would etch his name in Bollywood like none other star. He was after all India’s first superstar and perhaps the only one that could garner the crowds like none other and his downfall also was like none other star. Rajesh Khanna came, saw, conquered and was defeated. The book, “Rajesh Khanna – The Untold Story of India’s First Superstar” by Yasser Usman is an attempt to uncover as to why the man was the way he was, what led to his downfall and what happened that led to him becoming just another name or a has-been. Rajesh Khanna was more than just a superstar. I think he was an enigma that people wanted to believe in. He was the cornerstone of everything nice and pious with the world and the personification of romance and tragedy, till it all came crashing down. “Rajesh Khanna – The Untold Story of India’s Superstar” delves deep – into the star’s life – from childhood to his death day, of everything about him that is not told and everything that is misunderstood as well. Jatin Khanna (as he was born) was adopted by his uncle and aunt and brought to Bombay (as it was then known) and had dreams of becoming a film-star early on. Being the only child, he was treated like a prince and every whim and fancy of his was adhered to. His only ambition was that to be a film-star and nothing or no one could stop him. He entered a talent contest, won it and then became who we all know as “Rajesh Khanna”. One doesn’t know what it was about him that got fans crazy about him. The charisma perhaps. Or maybe the fact that the country was finally ready for a romantic superhero and his time was just right. Women would write him letters in their blood. Men wanted to be him and romance women. The country was riding on a one-man storm and then it all ended for the superstar. 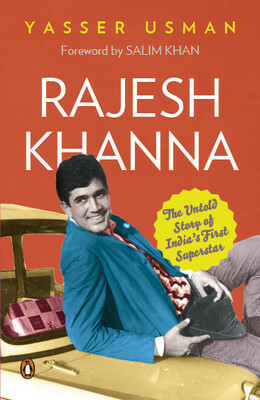 “Rajesh Khanna” is a book by Yasser Usman that delves on the persona of Rajesh and also the person that Jatin was. His loves – Anju Mahendroo, Dimple Kapadia, Tina Munim and more maybe. The relationships he had with the people of the film industry – the rivalry with Amitabh Bachchan, the closeness with Devyani Chaubal, the support he always had from Shakti Samanta, because of whom he became what he did and many more such people. The book speaks of his marriage to Dimple Kapadia, his election phase, his good movies and the bad ones, his wanting to have a hold on everything and everyone close to him and of his much-talked about possessive attitude. The book has a very neutral view of the superstar, his whims, his temper, his arrogance, his large heartedness and his refusal at not accepting failure. Usman’s writing is sparse, to the point and extremely effective. The writing makes you feel for the actor, makes you want to know more about him, watch his films and get to understand what made him and what unmade him. “Rajesh Khanna – The Untold Story of India’s First Superstar” is a book that shows us the various sides of Bollywood – of how you are praised at your peak and then thrown away unceremoniously when your films do not take you far. Read the book. Be wowed by the superstar. Turn the pages. Get to know his life. Take it all in. You will not regret it. This entry was posted in biography, Books, Non-Fiction, Penguin Books, penguin india, Review and tagged penguin books, Rajesh Khanna, Superstar, Yasser Usman on January 11, 2015 by thehungryreader.